Since I had been too busy and only posted 1 food review last month, I decided to post 2 food reviews today to make up for the lack of recent updates. Today I will be reviewing some pre-made packed Japanese Mochis I bought from Maruyu supermarket about 3 weeks ago, however they were not made in Japan, they were actually manufactured by a Taiwanese company called Royal Family. 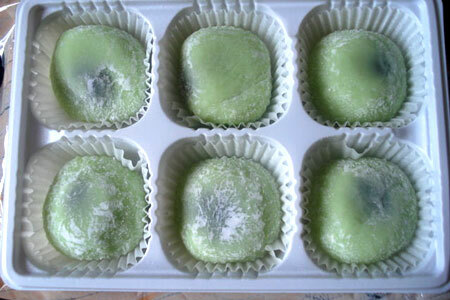 I have bought pre-made mochis from this company before and had even reviewed about their matcha mochi back in 2010. In my opinion, they make some of the best packed Japanese mochis and since I am familiar with this company, I did not hesitate to buy 2 packets of their peanut and taro mochis at Maruyu. 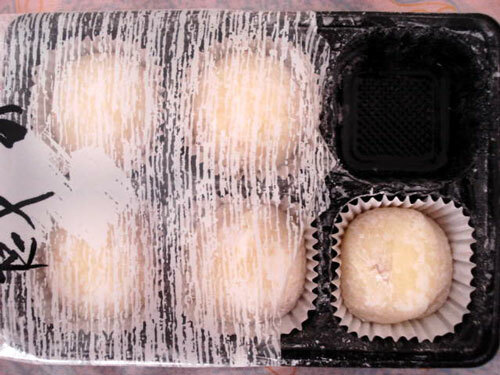 the texture and consistancy of the mochis were extremely soft and stretchy, so much so that they stretched as I tried to lift them out of the plastic tray. The filling was taro paste, but I was pleasantly surprised by how well the flavour of the taro was executed into the mochi, although the taro flavour from the filling wasn't too strong, but it was still substantial enough, and the taro flavour infused into the soft mochis further enhanced the overall flavour. 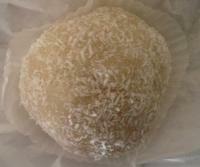 The mochis were also coated with a faint layer of icing sugar. Overall, these taro mochis were very good, among the many taro sweets & snacks I have tasted over the years with dismal to mediocre results, these taro mochis from Royal Family are among the rare ones which I thought were actually well executed overall. 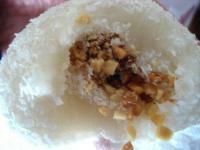 compared to the taro mochis, the texture of these peanut mochis was less soft and they were slightly chewer. The filling was peanut paste which had a pleasant substantial nutty flavour, and the addition of the peanut powder coating the mochis further enhanced the overall rich peanut flavour. However I do have 2 very minor complaints about these peanut mochis, firstly I thought there wasn't enough peanut paste filling, I would've prefered to have just a little more filling, and I still prefer the softer and stretchier texture of the taro mochis. But like I mentioned before, these are just very minor disappointments. Well to be honest, the main reason why I bought these 2 packets of mochi was because they were so cheap! Maruyu was selling them for only AU$2.50 for 2 packets! This just goes to show the stark contrast in price differences between authentic Japanese snacks and snacks manufactured in other asian countries. Snacks from other Asian countries tend to sell for dirt cheap, but authentic Japanese snacks & confectioneries (meaning snacks that are actually made in Japan) in comparison usually costs at least twice as much. The truth is, Japanese snacks are not expensive at all, at least not in Japan, in Japan they are actually very cheap. But once they are exported overseas, their prices suddenly sky-rocket, this is because it's more expensive to import products from Japan. So overseas shops need to significantly increase their prices for the Japanese snacks they sell in order to make a profit from them...thus, authentic Japanese snacks are much less affordable & consumed overseas than other Asian snacks. Which is a pity, because Japan make alot of very yummy snacks, but they are just too expensive for the average overseas person to buy on a regular basis. And I'm sure I have mentioned before in a previous post that authentic Japanese snacks are also much less readily available overseas than other asian snacks. Although, many of Japan's largest snack & confectionery manufacturers such as Glico and Meiji do have branches in other parts of the world, so they still do make alot of snacks for the overseas market, but these snacks are manufactured by the various overseas branches of these companies. For example, most of Glico's famous 'Pocky' and 'Pretz' biscuit stick snacks you find in Asian groceries overseas are actually manufactured by the company's Shanghai branch in China and Bangkok branch in Thailand. Hence I do not really consider them to be "authentic" Japanese snacks, since they are not made in Japan, even though they are still manufactured by Japanese companies. But this also means that these Japanese snacks made in the overseas branches are much cheaper than their original Japanese counterparts. Bottom line is that Japanese snacks ARE actually popular overseas...it's just that most of these familiar Japanese snacks that people overseas tend to buy are actually not made in Japan, as they are much more affordable than their original counterparts which ARE made in Japan. But for me personally, I love my 'Pocky' and 'Pretz' snacks, regardless of whether they are made by Glico's Japan branch or overseas branches! I do apologise for my long rant, I'm sure some of you might have found it to be a bit tedious to read! XD well, before I bore you any further, I better stop my rant...it's already almost 11:40pm here in Australia so I think it's bedtime now for me as I still need to go to work tomorrow. Until next time, good night everyone! Oyasumi! 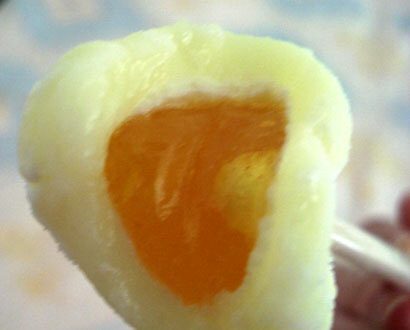 I love Japanese-style sweets & Wagashi such as Daifuku and Dango (japanese sweet dumplings on skewers), and Maruyu sells a range of different flavours of daifuku from Kido. But on the day I went to Maruyu, this blueberry & custard cream double pack was the only type on sale that day because it was nearing its 'best before' date. And since I had never tried any product from this particular manufacturer before, I decided to play safe and bought this cheaper pack. Since there's 2 different flavours in this pack of daifuku, I will review both flavours separately. basically the round outer mochi (rice cake) has 2 layers; the first white layer of mochi and the outer layer of mochi was infused with some subtle blueberry flavor and tinged with light pastel purple, I suspect a little bit of food colouring was used. But despite that little drawback, I loved the mochi layers of the daifuku, they were soft and chewy with just the perfect consistency and texture. And the sweetness of the mochi itself was not too strong, it was actually quite mild, and the blueberry flavor was subtle too. The filling stuffed inside those blueberry daifukus was blueberry jam, which I did not expect, I had initially expected the filling to be some kind of blueberry flavoured paste. The fact that the filling was blueberry jam was quite a disappointment for me, because I don't like any kind of fruit jam, since I've always thought they were a bit too sweet for my taste, I also don't like the lumpy consistency of jam. What's even worse was that the blueberry jam filling was so sweet, it just dominated the whole product, much of the sweetness and blueberry flavor came from the jam filling. The strong flavor of the jam was just too overpowering, so the balance of flavor between the mochi and the filling was inconsistent. Overall, this blueberry daifuku was quite a letdown for me, I love the mochi layers just fine, everything about the mochi itself was perfect, it had the right consistency and texture, so there is nothing to fault the mochi. What really ruined the daifuku was that overpowering blueberry jam filling, it was just too sweet for me. After consuming just 1 piece of the blueberry daifuku, I gave the rest to my fiance, because I could not tolerate the overwhelming sweetness of the blueberry jam anymore and the fact that I dislike fruit jams in general. 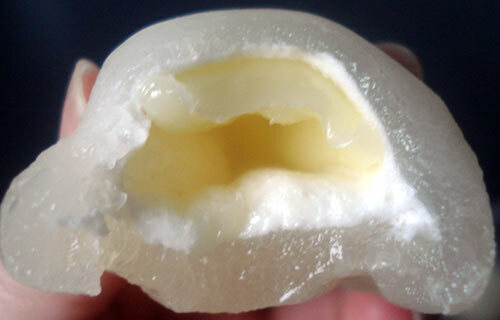 this custard daifuku also had a white layer of mochi, with a clear outer mochi layer, the filling inside is custard cream of course, and for me, this was a vast improvement from the blueberry daifuku. 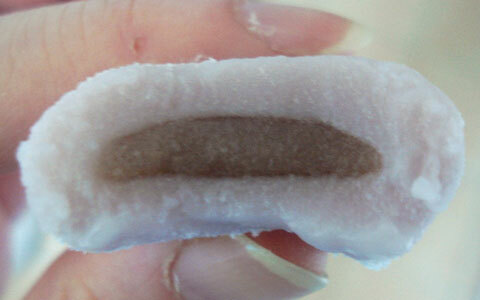 Again, the consistency and texture of the mochi layers were perfect; soft and chewy with subtle amounts of sweetness. The custard filling was also very nice, it was creamy and was not overly sweet. Compared to the blueberry daifuku, the flavours and sweetness of the mochi and the custard filling was much more balanced. Overall these custard cream daifukus were much better than the blueberry ones for me, like I pointed out before, the sweetness and flavours of the custard daifukus were more balanced, and so were the consistencies and textures. I happily devoured all the custard daifukus in the pack and was rather disappointed when I realised there were none left! I wanted more! Seriously, I wish the manufacturer Kido would pack their blueberry and custard cream daifukus separately, I would gladly devour a whole pack of their custard daifukus! 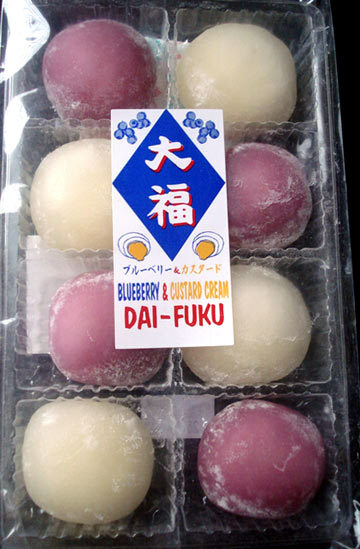 but when my hunger is calling and I'm snacking on food, I can seriously do without those blueberry daifukus. So here's my new LONG overdue food review, hope you all enjoy reading it I still have several more snacks I bought at Maruyu to review, so hopefully my next food review will be posted by the end of this week. the beauty with these little Kyoto candies is not really their taste, but their appearance, just by looking at them you can see that they are sophisticated and difficult to make, mainly due to all the different patterns and pictures embedded in the center of these candies. I was fortunate to have been able to witness with my very own eyes the making process of these candies, and I have to say, there's really no other reaction you can have but to stare at these dedicated candy makers at work in awe. These candies are made into long candy sticks and then cut into little pieces, but it takes a lot of effort to make just one candy stick, and they are made by carefully molding one layer at a time into shape and it's time-consuming. Another reason why it takes so long to make these little candies is that these are all carefully handmade, unlike many commercial confectioneries in the world these days which are machine-made. 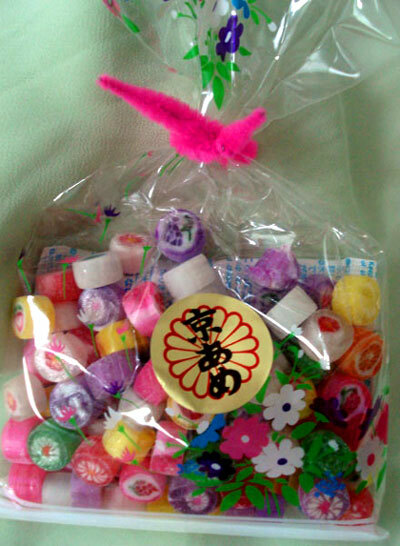 Then again, these Kyoto candies are not commercial candies, these are specialty candies, even in Japan these candies are mostly given as gifts, even though they are still reasonably cheap in terms of cost. As for the taste, well, that would be the downside to these Kyoto candies, with all their beautiful colors, sophisticated designs and patterns and grueling hours spent into making them, these candies taste rather bland and monotonous, the only flavour you'll taste is more or less sugar. So that's a disappointment, how much of a disappointment depends on the individual though. But as I emphasized before, what really makes these Kyoto candies special is their appearance, all the little colorful layers carefully molded into place one by one to create the patterns/pictures and borders, and then cut into little pieces, they're really like little pieces of artwork. It takes alot of dedicated time and hard work to master this kind of candy-making. 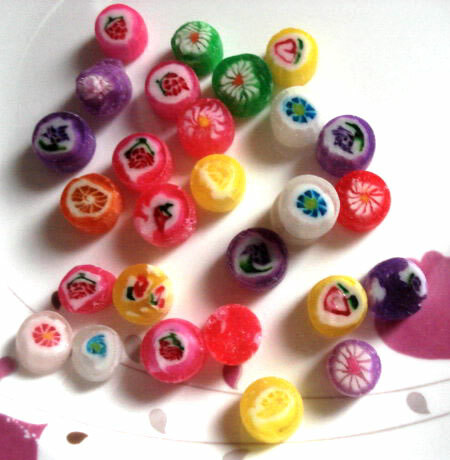 The main reasons I gave these candies such a high rating are because of their pretty appearances, colours and complexity, and also taking into consideration the so many grueling hours and efforts the candy makers invest into carefully handmaking these little candies. I would have given these Kyoto candies the highest rating if it wasn't for the bland and monotonous taste. Ok, now that I've cleared all the Pocky collaborative releases with Mart out of the way, let's move on to a different brand snack. During my latest shopping errand at my local asian grocery yesterday, I picked up this pack of dorayaki made by Marukyo, the same company that produced the Shirakiku Marukyo Funwariyaki I reviewed about back in February. Unlike the Funwariyaki, these are truly Dorayaki, I made sure I read the label! each pack contained 6 individually wrapped dorayaki cakes, these dorayaki were really no different to the Marukyo Funwariyaki, same texture same taste, the cake patties were really soft and with mild amount of sweetness. 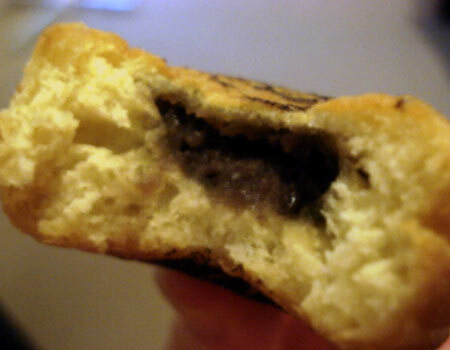 And the sweetness from the azuki bean paste filling was quite subtle too, which leads me to believe that just like for the company's funwariyakis, either very little or no sugar was added to the azuki paste during the production process. Further more, the azuki bean paste was not too fine, this is because the makers at Marukyo did not overly pound the azuki beans to make the paste, which left some of the skin of the beans intact, and that in turn helped to add texture to the azuki paste. The lovely flavor of azuki from the paste was strong, due to the lacking of sugar added in the paste, so the full flavor & potential of those lovely azuki beans was able to shine through. Therefore you're able to taste that lovely natural taste of azuki beans from the paste, and it complemented well with the mild sweetness of the soft cake patties. However, the one little draw-back about these dorayakis is that I thought the texture of the cake patties was just a little bit too dry for my palate personally, but that's merely my own opinion and is just a tiny wee dent on what is an overall great snack. Overall, these dorayakis are fantastic sweets for anyone who craves a snack that's not too sweet. I went shopping with some friends last Saturday at Chinatown and around the Sydney CBD area and decided to drop by at one of our favorite Japanese restaurants in the area; Kura restaurant for takeaway. I ordered one of my usuals the Sushi deluxe (you can read about my review about Kura's sushi deluxe here) and a serve of Taiyaki with matcha ice cream for dessert. Taiyaki is a popular Japanese-style fish-shaped cake made from either pancake batter or waffle batter and traditionally has azuki (red bean) paste filling...although nowadays, there's more modern variety of fillings available, such as custard fillings and chocolate, but you will usually still find Taiyaki with azuki paste fillings. I was a little disappointed that some parts of the batter skin was burnt, obviously the chef had slightly over-baked the Taiyaki, it's not exactly culinary pleasantness when you see dark burnt patches on your food, except maybe if it's for a BBQ, but not when you're baking Japanese sweets like Taiyaki. It brought out that unpleasant burnt taste, but luckily it was only very mild. The batter was rather plain and tasteless and there was not enough azuki paste filling for my liking, the flavor of the azuki paste was surprisingly rather bland as well, meaning the flavor was very subtle. Overall, these Taiyaki were disappointing, I have tried plenty of Taiyaki from other restaurants and vendors over the years which were baked MUCH better with just the right amount and balance of batter and filling, and were baked for just the right amount of time and with stronger flavors. I've always enjoyed dining at Kura restaurant and their food are mostly delicious at reasonable prices and the service is always good. 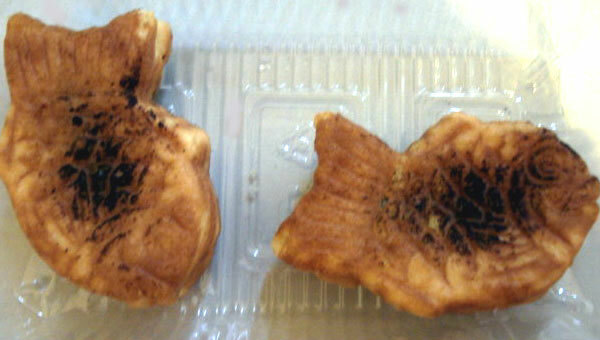 However, their Taiyaki is just one of the few disappointments I fault them on. This was the first time I've ever ordered Taiyaki from Kura restaurant, and frankly, I wouldn't want to waste my money on them anymore. But Kura does serve plenty of other food which are really delicious that showcases the talent of its chefs. If you want to know the address of Kura restaurant located in Haymarket Sydney, please refer to this entry. I went to my local asian grocery early this morning to buy some groceries and came across this pack of Shirakiku Marukyo Funwariyaki in the snack aisle. 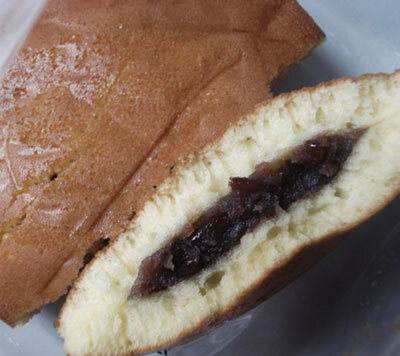 Initially I thought these were Dorayaki; a popular Japanese-style cake that consists of 2 small soft cake patties resembling pancakes with various kinds of fillings (usually azuki bean paste) sandwiched between. These cakes look exactly like Dorayaki, however it states on the package as 'Funwariyaki' This is the first time I have ever heard of 'Funwariyaki' and I have not been able to find any info about it online, so I am not sure whether Funwariyaki is a identical spin-off of Dorayaki, or 'Funwariyaki' is just a novelty name the manufacturer came up with for this product. 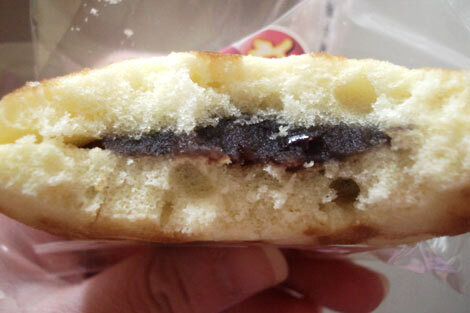 like Dorayaki, the texture of the 2 cake patties were soft and moist enough like sponge cakes and had very subtle hints of sweetness. The filling was azuki (red bean) paste made from 100% azuki beans grown in the northern Japanese island of Hokkaido, so you know they're the freshest and of the highest quality azuki beans. The sweetness of the azuki paste was also rather mild but still full of lovely azuki flavor. The subtle amount of sweetness of the azuki paste leads me to believe that very little, or none at all, sugar was added to the paste during the cooking & preparation process, to utilize the flavor of the azuki beans to its fullest potential. Overall these 'Funwariyaki' were lovely without being overly sweet...even for people who have the sweetest of tooth, often want a snack that's not dominated by sweetness, and these Shirakiku Marukyo Funwariyaki are an ideal treat when you want to indulge on sweets that are not too sweet. There seems to also be a matcha-flavored Funwariyaki by Shirakiku Marukyo, in which matcha is infused into the cake patties. I would love to try that one too, but I have not seen the matcha Funwariyaki in any of the asian groceries I've been to. So for the moment, it seems the only way to get my hands on the matcha flavor is to order it online, several online stores that sell asian sweets seems to have it in stock. What I love about Japanese sweets is that Japan tends to put only about half as much sugar into their sweets & confectionery as western countries, without degrading the quality in any way. Bought these yesterday during my frequent grocery trip to Tong Li, Japanese matcha (green tea) mochi (again), but this time it's made by a different company, this one is from Bamboo House, another Taiwanese company that specializes in Japanese Mochi. firstly, I love the beautiful print on the box! The glutinous rice molds of each piece of mochi was very soft and chewy like it should be with a nice pastel green color while the filling was matcha paste. Overall these were really nice & fresh...although I would've liked these a bit better if they had a bit more matcha flavor in them. 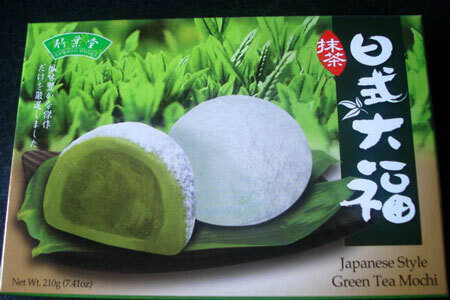 I still prefer the matcha mochi from Royal Family...but these were still good though. 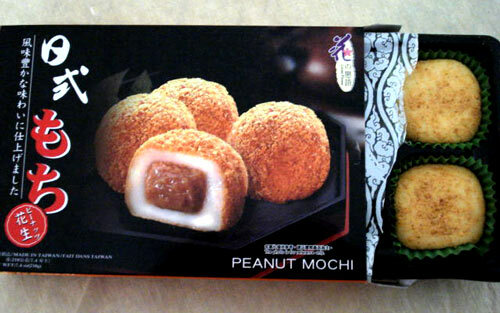 My second review on peanut mochi! I love Mochi, or any kinds of Wagashi...in case any of you don't know, Wagashi are traditional Japanese sweets normally eaten with tea, they are a staple during Japanese tea ceremonies. I loved these, the glutinous rice molds of each piece were lovely, soft & chewy, as they should be. The peanut paste filling and dusted peanut powder surrounding each piece really brought out a pleasant peanut flavor, not too strong, but not subtle either. These were much better than the single serve peanut mochi from Nice Bakery I had back in August. 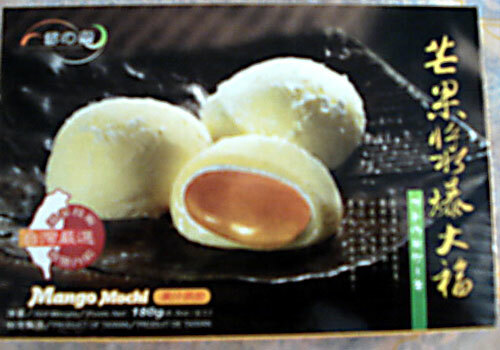 because she bought me a mango mochi (which btw, was cho oishii so!) from the same bakery the other day that looked exactly the same from outer appearance, I had assumed that it was another mango mochi...until I took my first bite & instantly felt the crunch & tasted the flavor of chopped beautifully roasted peanuts (and quite a large amount of it too). 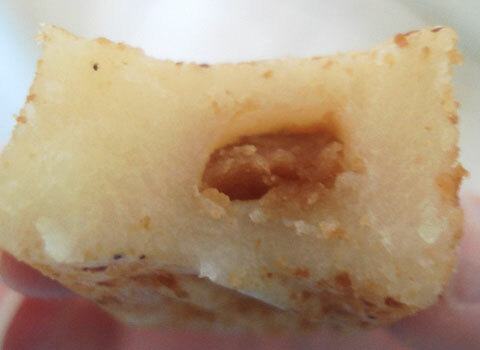 The filling also contained quite a large amount of white sugar to balance out the savory taste of the peanuts. 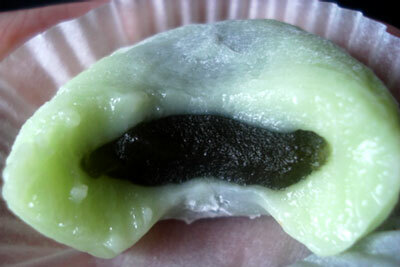 The glutinous rice mold of the mochi was soft & chewy and beautifully sweet, yet not too overpowering. And I love the addition of the shredded coconut sprinkled around the mochi. Overall it was quite good...my only complaint about it is that I did not like the addition of the sugar in the filling, I felt it was unnecessary. It made the mochi taste even more sweet than it needed to be. the jelly was thick with beautiful bright orange/yellow color, but I thought it was a bit overly sweet & the manga flavor was a bit too subtle. But overall, it was decent.